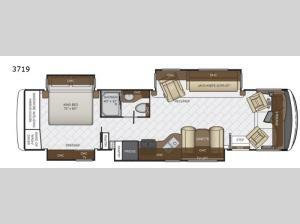 Enjoy the change of scenery from the windows, but the comforts of home stay the same in this quad slide out Canyon Star 3719 class A motor home! The welcoming living room invites you to visit with your family and friends. Here there is an 87" jack-knife sofa plus a recliner. There is plenty of room at the booth dinette for your family to enjoy mealtime, plus at night this area converts into additional sleeping space. In the rear you will find a large bedroom with a king bed plus there is an area that has been prepped for a washer and dryer so now you won't have to bring home any dirty clothes!